Built upon the award winning AS50R, the AS50D is a superb amplifier featuring a new tweeter, phantom powered microphone channel, digital chorus and reverb... allowing you to express your emotions with passion. The AS50D is a compact and portable 50 Watt combo amplifier specially designed for use with acoustic instruments. Between its two channels, this combo has the flexibility to handle instruments with transducers, such as piezo or magnetic pick-ups (channel 1), or microphone for either vocal or instrument reproduction channel 2). The AS50D's built-in Chorus effect is assignable to either or both channels and the Reverb can be controlled and balanced between the channels to create just the right ambience. If you want to add further effects, then there is an on-board parallel effects loop which can be balanced between the channels in the same way as the Reverb. One of the most difficult aspects of amplifying some acoustic instruments is feedback. 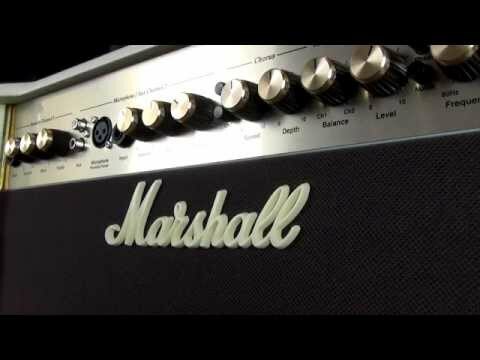 To help you eliminate this, the Marshall AS50D features several ‘anti-feedback’ controls, including a Phase switch and a frequency controllable Notch Filter. The combination of these two elements will give you precise control of the frequencies where feedback is likely to occur and help you to eliminate them. For clear and detailed performance, the AS50D amp is loaded with two 8 inch speakers and a high fidelity polymer dome tweeter. There is also an internal limiter which allows you to push the maximum level from the 50 Watt output, whilst remaining distortion free. Neat and compact, flexible and portable, the AS50D is the ideal amplifier for the acoustic player who wants a system as suitable for small gigs as it is at home. Posted on 21/01/2019 by Wilko Why is the same amp in black 2/3rds of the price????? Rant done ……………… It's just perfect for home jamming, barbecue gigs, and teaching - plug the kids into channel 2. I would have bought a second one but for the price change. Posted on 17/01/2019 by Wilko Bought for garden gigs in the summer, so I won't be turning up to 11. I'm already using it regularly for practise. My Taylor sounds just great through it. Only issue I have is that the power lead supplied is a 2 pin continental. I had to steal one from a kettle to try the amp out. Otherwise great value for money and a handsome addition to my toys. Posted on 15/02/2017 by anthony Amazing sounds great far better in life than any vids shown online, 110% blown away. Posted on 15/06/2012 by PhilA Guitar amps are designed to colour the sound of your guitar. Whilst this is necessary with electric guitars, it can be a pain in the neck with acoustic guitars. For an acoustic guitar to sound its most natural, the very minimum of colouring is best. This amp does that. It has the right controls to set it up so your nice, beautiful, acoustic guitar's sound doesn't change - it just goes loud. You can, of course, add to the sound with some reverb and chorus to sweeten the sound. The EQ is powerful and can take out the harsh top end of some piezo pickups and features a notch filter to help get rid of feedback, as well as playing effectively with the mid and the bass frequencies. Whilst nothing on earth can make a naff acoustic sound great, if you need to you can enhance your guitar sound to make it sound as good as it is going to get. Certainly better than plugging straight into a PA. The mic input has phantom power, so you can mic your guitar if you want, or use it as a 'mini PA' and bob a vocal mic in. This is not a feature I use to be honest, so can't really comment on it. When I've tried it out, it sounds fine and would be great for busking or a little home gig. Another good thing is that it’s nice and loud with plenty of headroom. Whilst I haven't turned mine up to 11, I have pushed it enough to keep up with a drummer without having the sound distort. The only thing is that when blasting it, you need to be careful with the top end, as it can get a little harsh. All in all, a proper good acoustic amp and well worth the money.